This isn’t a post about my triumphant return to pre-pregnancy form. This is a real-life version of how much it hurts and how much time it takes an average gal (I consider myself an average body size) to get back into her ‘pre-pregnancy’ jeans. Now I’m not writing this to discourage anyone. 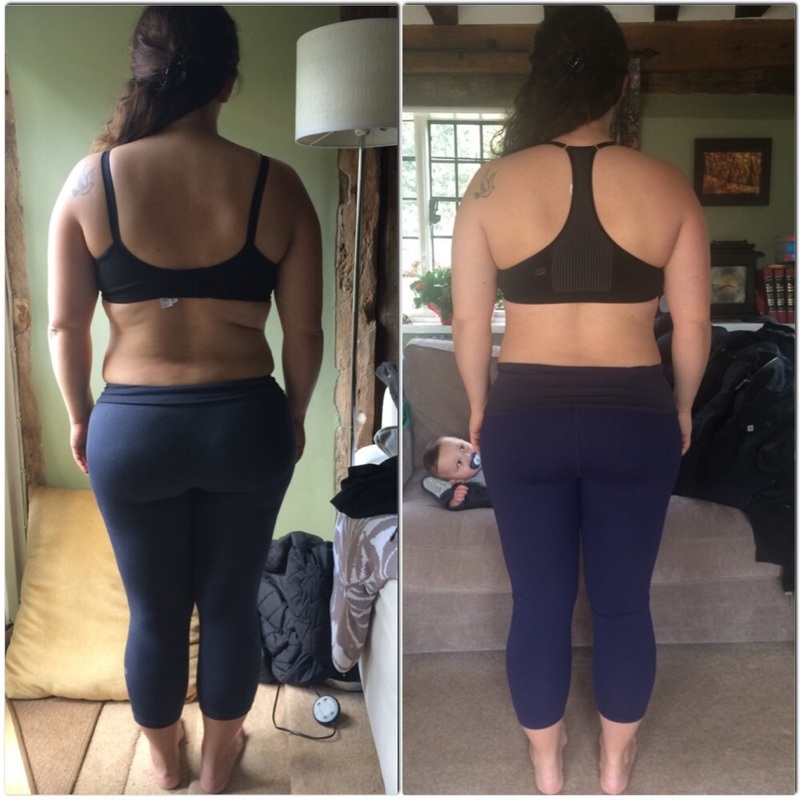 In fact you’ll see from the deeply revealing photos at the bottom (deciding whether or not to post the before and ‘after’ was a struggle) that the weight and shape do eventually come back. I’m just posting my own journey in the hopes that us mums will stop being so hard on ourselves and start to give ourselves props for trying. I also realise that this post may offend some. I’m not trying to make those mums who did slip right back into their skinny jeans after a month, feel bad. I think that’s fantastic and I wish I had a piece of your gene-pool. For me, this was not the case. I was a pretty fit person before baby. Fit being the word to describe my activity level and not my level of hotness as it is used by the Brits. I have run the London Marathon and done countless other half marathons. 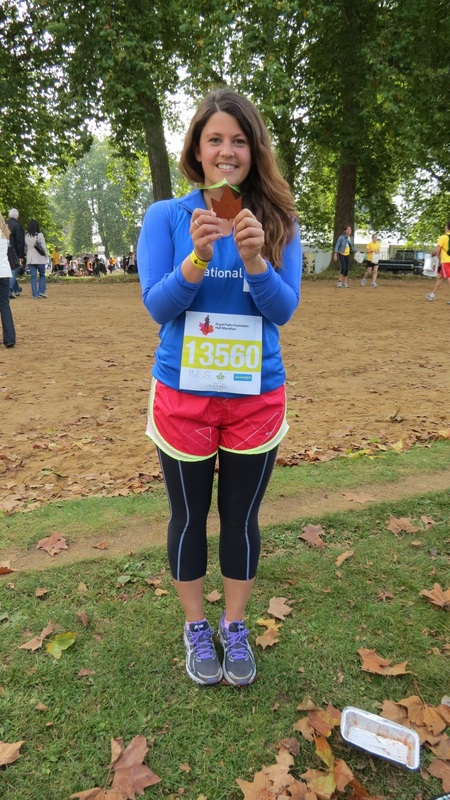 (See photo below of me a year before pregnancy…fresh off finishing a half marathon in London). I tried to work out a minimum of 3 times a week. I take the stairs, I go for walks. I actually like to exercise. I was on the chubbier side of ‘average’ when I got pregnant. One thing about living in the UK is that I tend to frequent the pubs, well, frequently. With that comes pub food and all the amazing comfort and sadly, calories, along with it. So I was slightly chubby but I was now also pregnant. AKA…a woman’s only legal time to eat ANYTHING they want and feel completely guilt free. I realise this isn’t actually true but that’s what you tell yourself when your body literally convulses at the sight of lettuce. I tried to eat healthy as well but alas my little foetus thought differently. The only thing I could stomach was a McDonald’s cheese burger. You know, those little ones that you used to get as a kid in your Happy Meal? Yep…I ate those almost daily. No fries (thank God I didn’t crave those) and I didn’t even really want sugar (more than normal anyway) but I couldn’t get through a week without my poor husband having to drive up to those golden arches and take the slow walk of shame up to the counter. Before pregnancy I hadn’t eaten McDonald’s in years. Suddenly, it was the only place where I could trust that the smell and taste would be EXACTLY the same every time. Bless McDonald’s and their hugely over processed, standardized “cooking”. So when the lovely doctor tried to tell me that I was on the ‘heavier side of normal’ at my three-month check-up, I wasn’t surprised. The worst part was that he told me the basic truth of it all…my weight was only going to go up over the next six months. I have to admit, I took it in stride. I wanted a healthy baby so if my body was going to hell to make that happen, then my vanity could afford the suffering. In total I gained close to 60lbs (27kg) during my pregnancy. And although I know that’s definitely on the heavier side of normal for a pregnancy, my point is, whether it’s 16 or 60 pounds, your body is different post pregnancy. It has every right to be…it just grew a human…give it a minute. I am 10 months into my ongoing battle of the baby bulge and I’m finally starting to see the results. I’ve had to get back to eating sensibly. Salads, grilled veggies, lots of fish and chicken are now staples but I haven’t restricted myself to the point of exhaustion (clearly not or this post would be very different). I took the realistic route. I knew there would be pubs, parties and lots of weddings in my immediate future. It was summer in lovely England. Pimm’s and Eton Mess were an absolute must. My husband and I went to SEVEN weddings in the past 10 months. Seriously… I don’t think I have any friends left who aren’t married. They all decided to get married in the summer after I gave birth. Great for them and me as I love weddings (and the champagne and cake that comes with them). My body however felt less than inclined to let go of the fat. I was working out 3 times a week and trying to get back into running (mums…two words…pelvic floor). The pounds came off very slowly. In fact they started to go back on after a few months. I hit a low after about 6 months when I started to notice my clothes had started to get tight again. I realized I needed to get back to the basics. I cut back on carbs, increased my veggies and stayed away from sugars as much as possible. I had to be honest with myself and my level of commitment. I started working with a personal trainer (who just happens to be one of my best friends Frankie). Now before you all start yelling at me that “not everyone can afford a personal trainer,” I’m a freelance writer people…I can only afford to have her train me for one hour, once a week; the rest of the week is up to me. Also, before you judge, check out the prices for a personal trainer. Many won’t cost you any more than the price of a dinner out with your hubby and from that one session you can get some great exercises to use in your own workouts. They’re a fantastic investment in your own fitness. I told you – I have had a very realistic struggle with my body since baby. I can’t tell you how easy it is to hide away in baggy sweaters and yoga pants; not to mention those maternity jeans look so cute and are sooo comfortable. Fess up ladies, I know I’m not the only one who wore those a bit too long post-baby. But I knew I wanted to feel attractive again…for me. I knew I couldn’t blame my pregnancy any more. I’ve lost just over 40lbs of my pregnancy weight. Those last 15-20 pounds are of course the hardest to get rid of. But I’m continuing to work at it. I’m moving more. I also make sure I’m strict food-wise during the week, and my weekends are fun. Cakes and pubs are a reality and I’m not going to skimp on those. My goal is to be back to my pre-Sam size by his one year birthday which is in May. 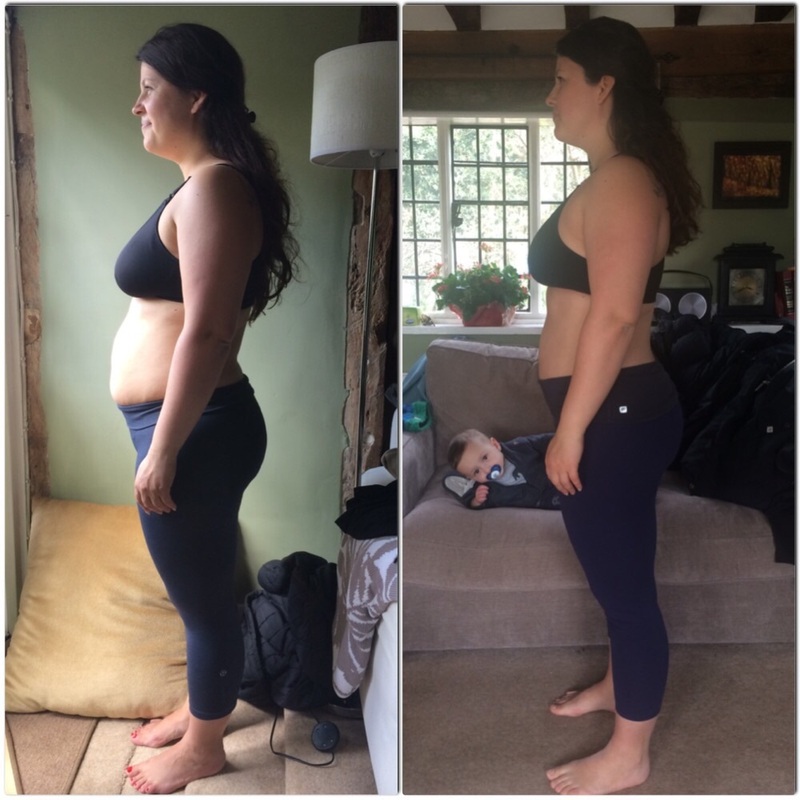 So here is my progress so far (see pics)…The ‘before’ photo was me about 8 weeks post pregnancy so I had already lost a bit of the weight. This is of course an ongoing process and I’m far from done yet – but I’m headed in the right direction. I’ll keep you posted on the final ‘after’ photo. Cheers to you fit and fab mums out there. Previous Post Go back to work or stay home? Next Post Flying with a Baby: Tips from a mum who’s been there. Thank YOU for writing this and posting pics (especially the back side!) I really needed to read/see this today. My baby is 7 months old and yesterday I stepped on the scale for the first time post-pregnancy. That was a big mistake. I thought I was doing so well. Thank you for reminding me to be realistic, and showing me that things will change for the better over time. Hi Amanda – yes I don’t look at the scale any more. To be honest, the scale now rarely moves…but the inches seem to be getting smaller. So I now judge my progress via inches, photos and my pre-preggo jeans. When those are feeling comfy then I know I’m at a good place. The scale be damned! Good luck!